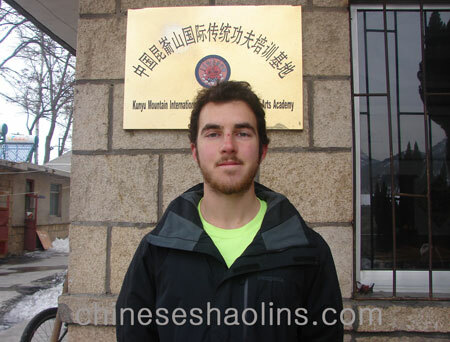 I chose China to study Kungfu because I was very fascinated about the Chinese martial arts and wanted to learn more, and because I was already here as a foreign exchange student. I was motivated to come here because I believe the spirit and lessons of training like this can make me a better person. Chinese:武术不仅是技击 ，也是一种品德。修身养性。I value this personal development not just for myself, but more importantly for how I can use it to help others. In my time here I believe I have gotten off to a great start in the practice of Chinese martial arts. My greatest gains from my training here at Kunyu mountain have been all I have learned about Shaolin kung fu,Tai chi Chuan ,Chi kungfu and their spirit and mindsets. I think the mentality and spirit I have been learning and practicing here has been a much greater gain than any of the physical movements. First and foremost, master Gao，and all of the masters. I am very thankful to every single person in my training group; all of them have taught me something and given me great help while I’ve been here. I owe any progress I’ve made here to them, and I am very glad to have been so lucky to train with them. I am also grateful for all the other masters, the translators, the staff, and the other students. All of them played a part in making my time here so great. Daily life at Kunyu is centered on training, of course, but while I have been here I have also been able to learn some more Mandarin, meet plenty of new friends, and learn from all of them. The people here really are the best part of living at Kunyu Shan. They are also what makes the training so great. Being able to make friends with people from all over the world and with such different stories has been a great experience in itself. I also appreciated the accommodations, the dorms, the meals. Though there are little problems, and it is not as comfortable as I used to, I am still very glad to be here. In fact, having a little bit less comfort is a good thing, especially if you are here to train. For school location and scenery,I enjoy them! I think the scenery is beautiful, and very different from my hometown, New Orleans, too. I especially enjoyed our visits to the temple during our mountain runs or Daoism classes. The air is quite good.The indoor training hall is a great thing to have, especially in the winter. As for Yantai, I went once or twice, but most of the time I was able to find plenty to do here at the school. I usually did my shopping in Muping town.